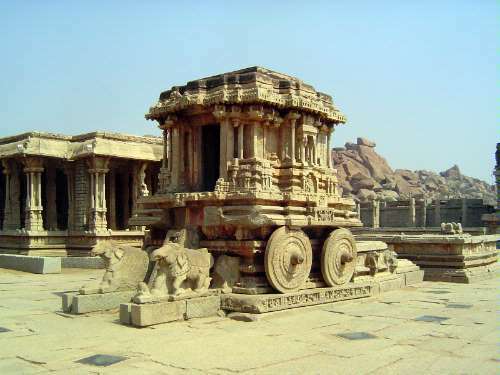 Unlike Agra, Ellora, and Konark, you can't fly to Hampi, which remains a jangling six-hour drive from Hyderabad or Bangalore. 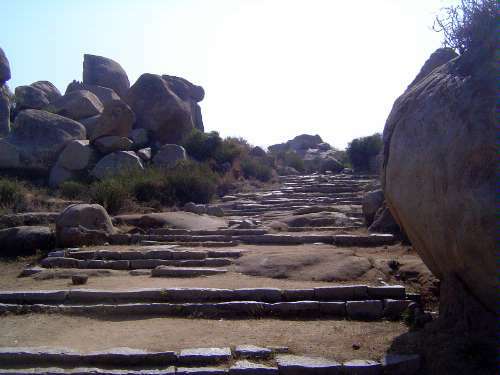 Even so, it's become a popular place, boosted in 1986 when it landed on UNESCO's World Heritage List. 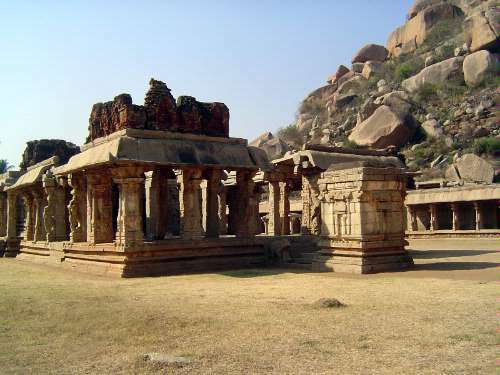 It did so as Hampi, not Vijayanagar. An interesting choice--preferring the name of an on-site village to the name of the imperial capital based here five centuries ago. 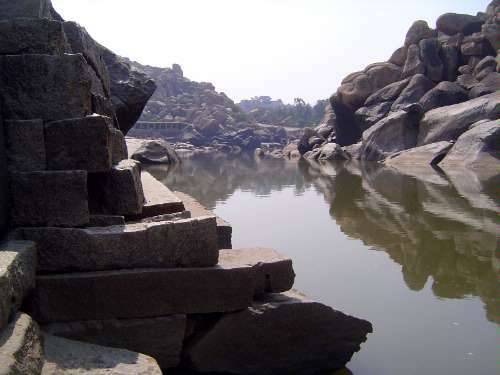 Still, it's not a bad choice: Hampi is a corruption of Pampa, the original goddess of this place. 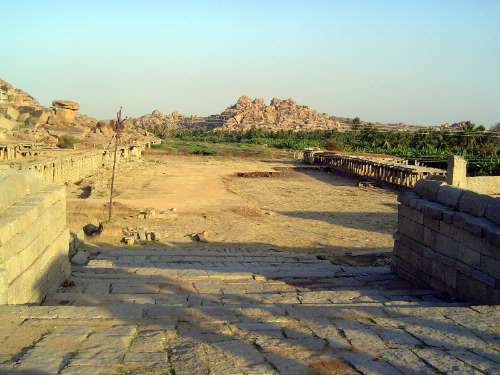 Vijayanagar, or "City of Victory," sounds like a 14th century public-relations campaign. 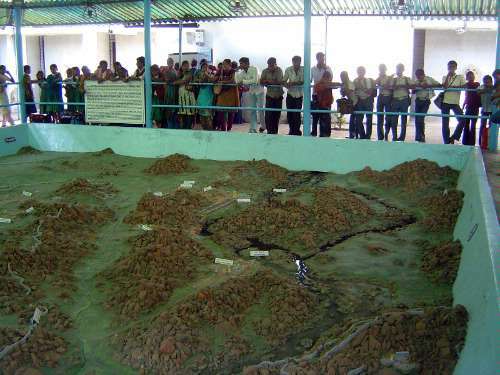 A relief model in the museum at Kamalapura shows the walled city in the distance and two major temple complexes between it and the Tungabhadra River. 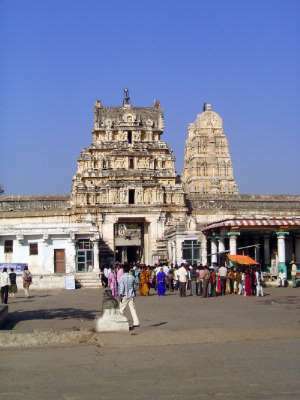 The temple on the right is the Pampapati ("Lord of Pampa") or Virupaksha Temple--Virupaksha being another name for Shiva. 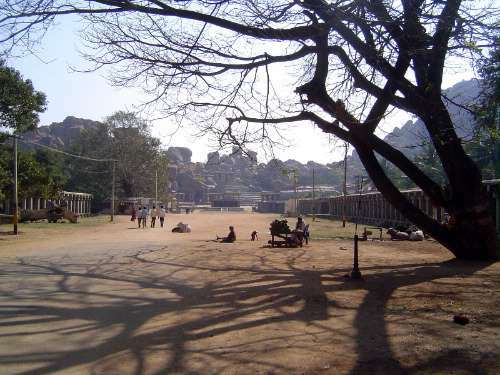 The Hampi bazaar stretches straight to the left and toward Matanga Hill. 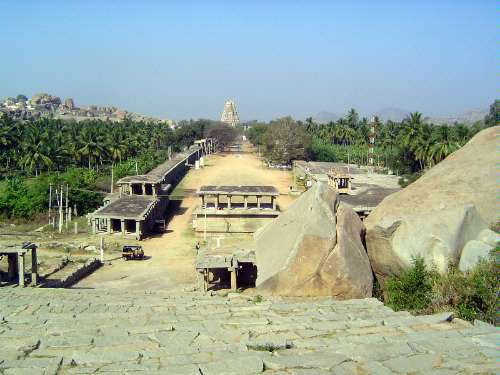 Just on the other side of that hill is Achutraya's or the Tiruvengalanatha Temple. 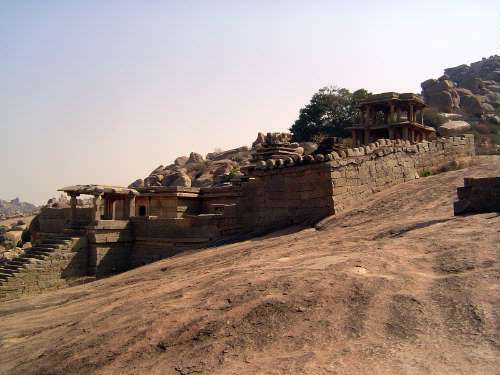 Hugging the hill slope still farther to the left is the small Narasimha or Jain Temple, older than the others. 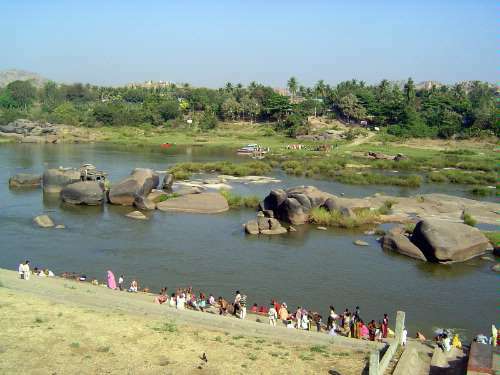 Where Matanga Hill tumbles down toward the river's edge is the Chakratirtha, the holiest bathing place along the river. 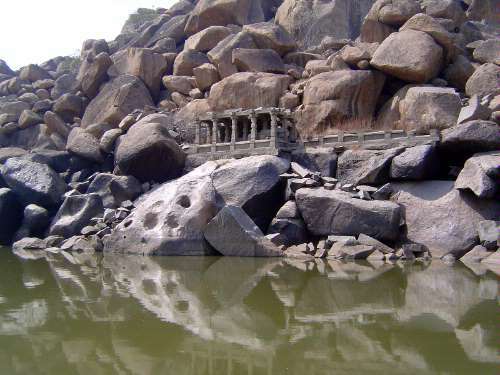 Facing it, the Rishyamukha Hill is a world-class jumble of granite boulders. We're just shifted position a bit. 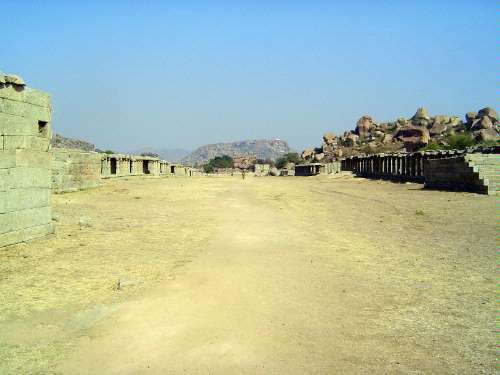 This time on the right is the end of the Hampi Bazaar, then Matanga Hill, Achutraya's Temple, the Narasimha or Jain Temple, and finally the major complex of the Vitthala Temple, again with the straight street of its now vanished bazaar. 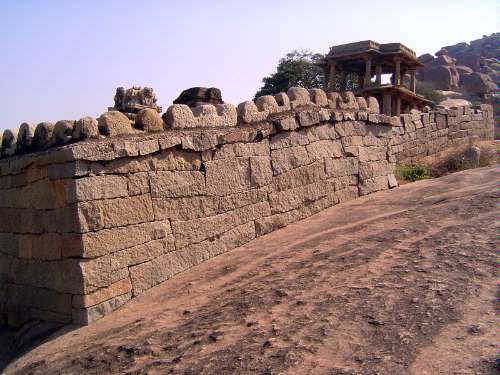 Near the left edge, the Talarighat Gate can be seen in the city wall. Why is it that maps like this intrigue people more than those printed on paper? Is it because they are simpler to grasp? 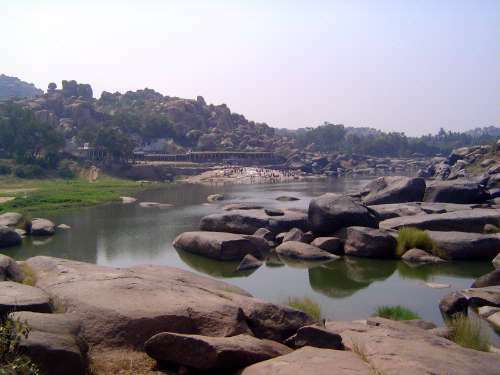 The old Murray guide to India devoted several pages to Hampi. During the city's heyday, too, between about 1350 and 1550, numerous foreign visitors came by, especially Portuguese. Then the curtain came down. 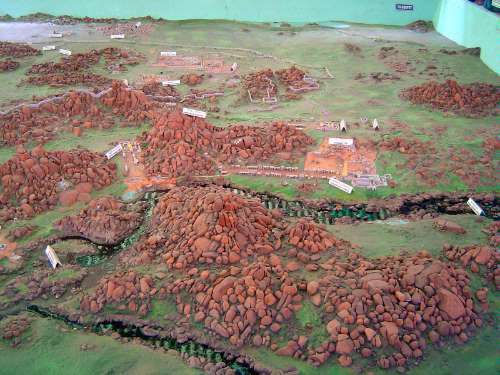 The city was sacked after its army had been routed at the Battle of Talikota, about 60 miles to the north. When Cesare Frederici arrived in 1567, he found a ghost town, inhabited, he wrote, by tigers. It was still dead when Colin Mackenzie came by in 1799. The site was very quiet when Alexander Greenlaw, a British colonel stationed at Bellary, took a large set of photographs in 1856. He wasn't the only intrigued Britisher. Robert Sewell, stationed at Bellary 40 years later, translated and published in 1900 two Portuguese accounts from the 1530s, one by Domingo Paes and the other by Fernao Nuniz. 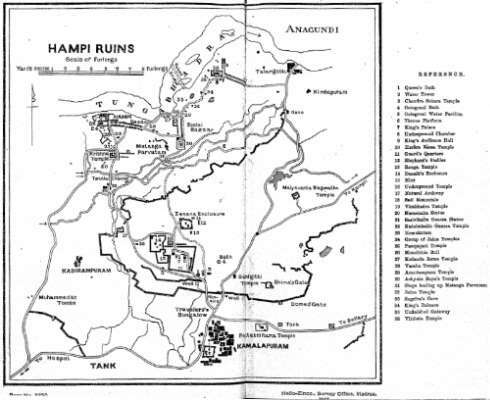 In 1912, the government's Archaeological Department published a report on the place, and the first guidebook appeared in 1917 under the title Hampi Ruins Described and Illustrated. The author was A.H. Longhurst, superintendent of the Archaeological Survey Department, Southern Circle. Here is the map from Longhurst's guide. It is still the most legible tourist map, even if Longhurst was unaware of the now-famous Stepped Tank, unknown in his time. It's not that his is such a wonderful map, but current ones are almost unreadable. 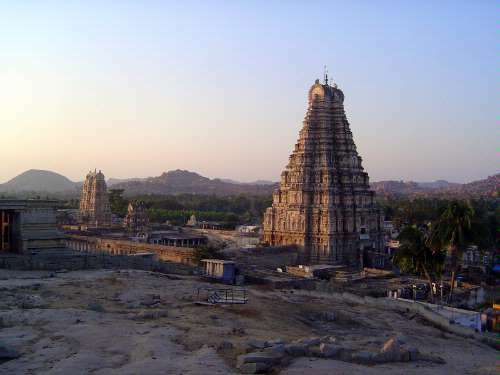 Hampi is popular with pilgrims as well as tourists. 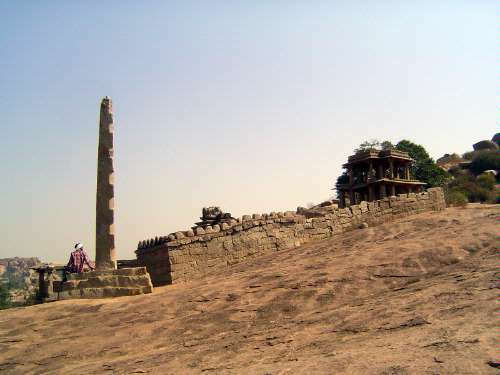 The pilgrims have no particular interest in the political history of this place, with its three dynasties--Sangama, Saluva, Tuluva--ruling from about 1350 to the collapse in 1565. They have no interest in the incessant warfare with the Muslim states to the north or in Vijayanagar's imperial expansion over most of India to the south. 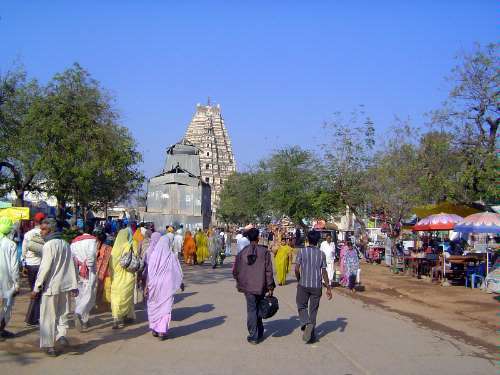 Pilgrims are interested instead in the Virupaksha Temple, the only active temple on the site. 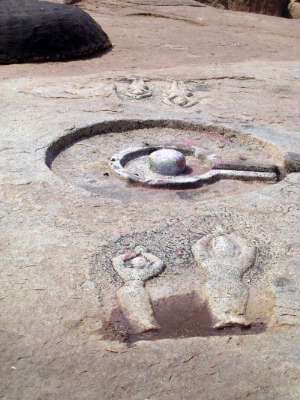 Virupaksha was the family deity of the Sangama dynasty, which ruled in his name and with his protection. The two later dynasties were more ecumenical, adopting Vishnu as well. 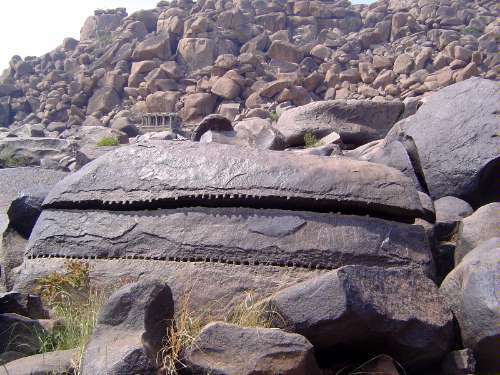 And Pampa, the goddess who was here first? She was "Sanskritized" by importing Shiva and making her his wife. The sheet metal up ahead covers a temple cart used in a February festival. 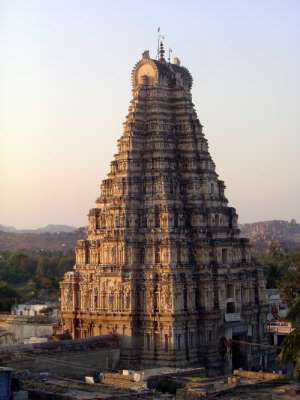 The east gopuram or entrance tower to the Virupaksha or Pampapati Swami Temple was built in the 1400s but rebuilt about 1800, perhaps by the same British officers in Bellary who are known to have repaired another part of the complex, the northern tower. 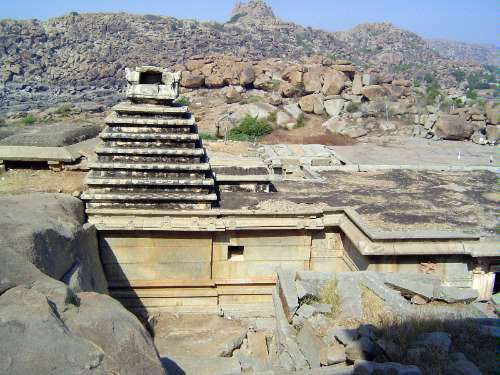 The gopuram form comes from farther south--a Tamil inscription on this gopuram reinforces that point--as does the construction method, with a granite base but a brick and plaster pyramid. Another standard element of the form is the open window on each level. So, too, the projecting bays, each framed as a facade. The right-hand side. The upper bays are empty. Were they originally so? Doubtful. 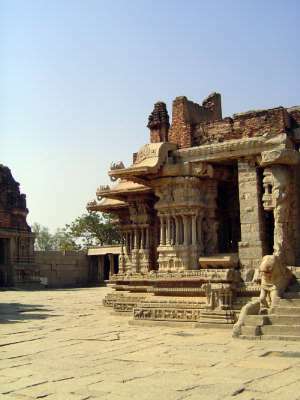 A courtyard leads to a second, lower gopuram. 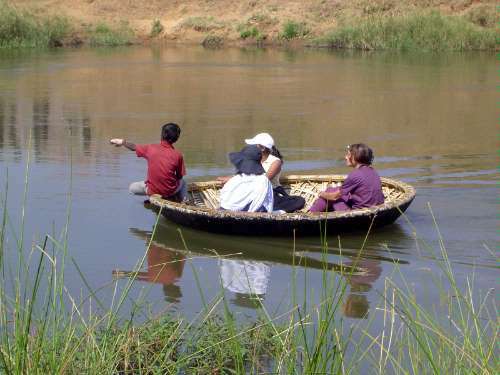 As late as the 1920s, foreigners were allowed no further. Today, they can enter after buying a ticket at the window on the left. Disappointment awaits if they anticipate still greater magnificence within, because the climax of visual display comes with the first gopuram; after that, opulence declines almost step by step. That's fairly typical. Murray's guide of 1924 says not to worry, "as the temple differs in nothing from the ordinary type which can be visited anywhere." (How did Murray know? Simple: a British police officer in 1870 had forced his way in while chasing a suspect seeking refuge. With that precedent, a few other officers on duty were thereafter admitted.) 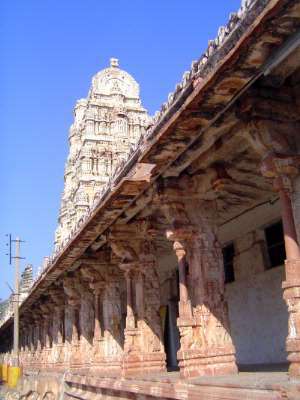 The north gopuram rises behind the wall. The shala or barrel-vaulted roof on both towers is another standard feature. 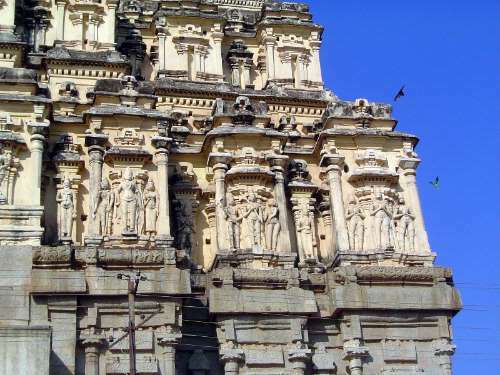 The second gopuram, though much lower than the first, has sculptures in the bays of the upper tiers. A second courtyard opens. 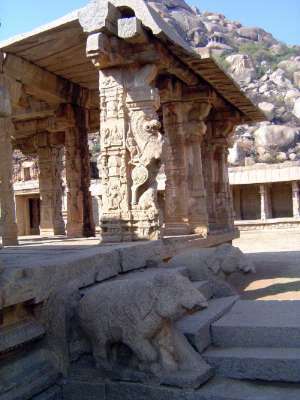 The detached colonettes on each pillar are a standard feature at Vijayanagar. The colonette can take the form of a mythical animal, most often a yali, half-horse and half-lion. Here the form is half-lion, half-elephant. 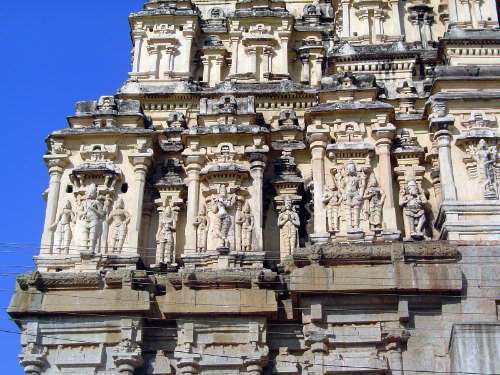 The north gopuram, repaired by order of F.W. 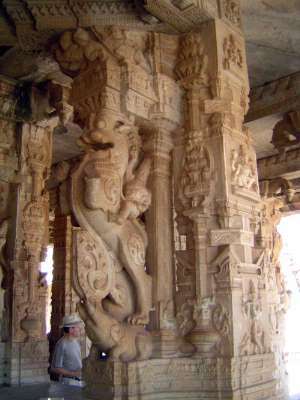 Robertson, Collector of the Bellary District in 1837, has miniaturized pilasters in each bay instead of the usual sculpture. The close-quarters of the inner sanctum. It used to be lit by hundreds if not thousands of candles. The same, in 1981. 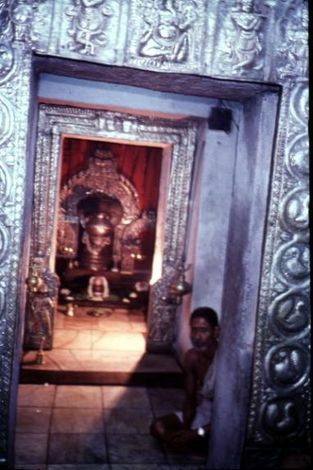 Several things have been altered since then, beginning with the golden lingam visible here. A bit closer, but still from 1981. 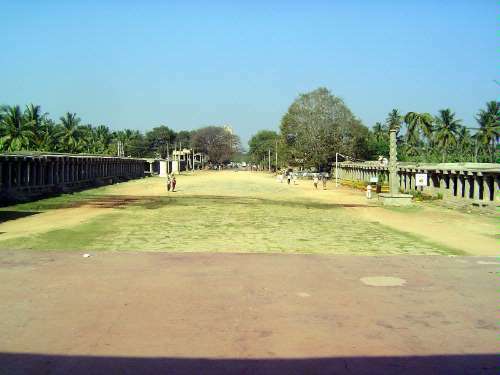 Looking west toward the north gopuram and over the Manmatha Tank. An admirably versatile cook, though regrettably weak on Canadian cuisine. 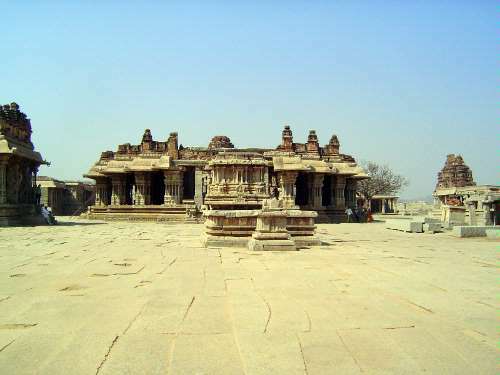 The temples of Vijayanagar were commercial magnets, and the major ones all had bazaars organized around broad, straight streets leading to the associated temple. The street here looks much too wide, but it was along this street that the temple cart was pulled on festival days, when many thousands would gather. The view here is eastward, with Matanga Hill on the right. 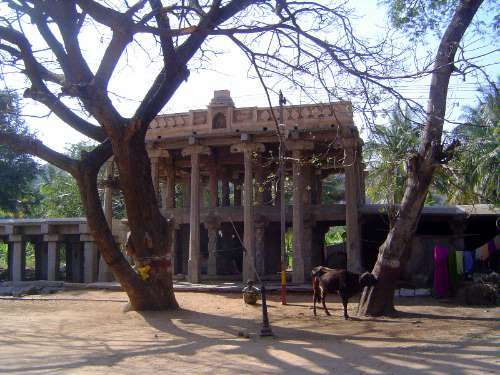 The view in the opposite direction, with the east gopuram of Virupaksha peeking over a tree. Some accounts suggest that the width of the street was a necessity on non-festival days, too. Duarte Barbosa, who was here in 1516, wrote that the houses of the people were "arranged according to occupations, in long streets with many open places. 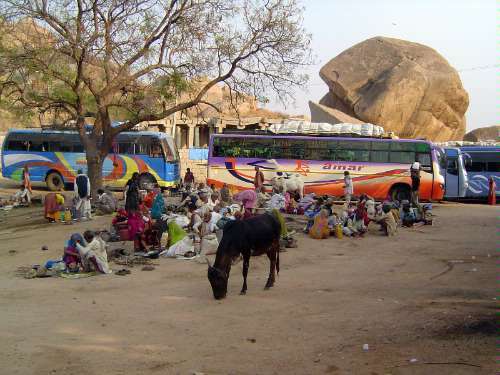 And the folk here are ever in such numbers that the streets and places cannot contain them." 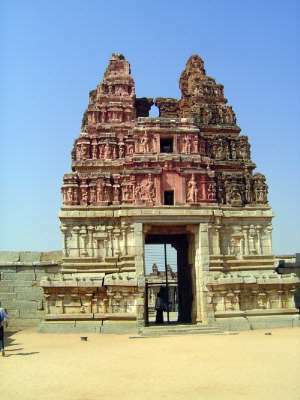 Barbosa admired Vijayanagar. The king, he wrote, allows "such freedom that every man may come and go and live according to his own creed, without suffering any annoyance and without enquiry whether he is a Christian, Jew, Moor, or Heathen. Great equity and justice is observed to all, not only by the rulers, but by the people one to another." 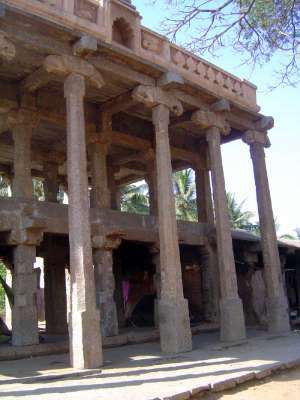 The bazaar is fringed by granite-framed buildings, in this case one with two storeys behind a high portico. A closer look. Until at least 1917, the premises along the street were rented to pilgrims during festivals. Without the festivals, Longhurst suggested, the wide street would otherwise have been plowed and cultivated. 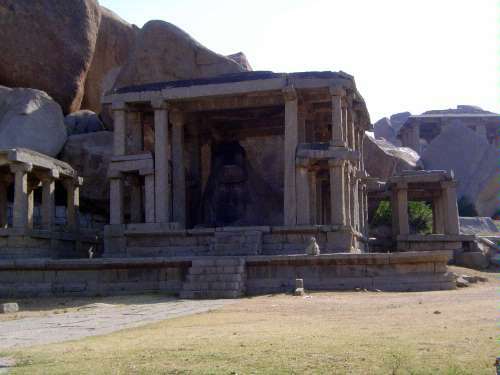 The stone frame in this case houses a monolithic Nandi, arranged conventionally to face the temple of his master, several hundred yards to the west. 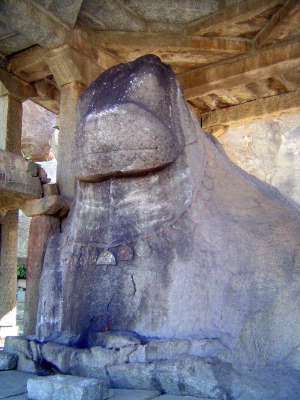 The image is crude but carved from a boulder. There are several other monoliths nearby. 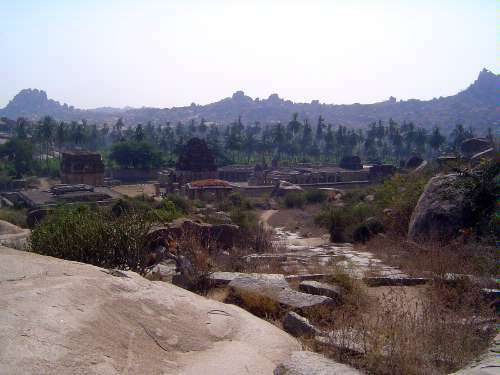 Domingo Paes, here about 30 years before the kingdom's collapse, wrote that Hampi's bazaar was "a very beautiful street of very beautiful houses with balconies and arcades, in which are sheltered the pilgrims that come to it...."
Over the pass, the view looks down on a desanctified temple named either for Tiruvengalanatha (a form of Vishnu equivalent to Venkateshwar or Srinivasa) or for the king who ordered its construction, Achyutaraya. 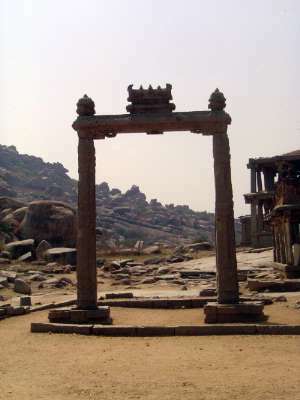 The dedication marks the shift of Vijayanagar's rulers to a more ecumenical religious outlook, no longer limited to Virupaksha. What! Another crowd! This one speaks a mysterious language called French. They've gone, vanished like the will-o'-the-wisp. 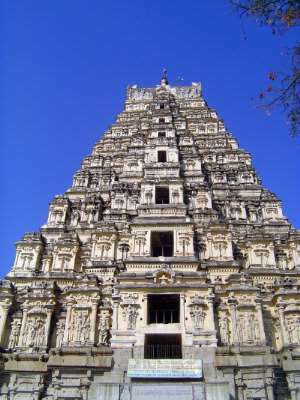 This gopuram lacks its pyramid, but the base, as ever, is comprised of symmetrical halves separated by a full-height entrance twice as high as it is wide. These things really are built by the book. The interior is wrapped by a double wall. A half-lion, half-horse yali. He is mounted and leaps over a tiny kneeling elephant. 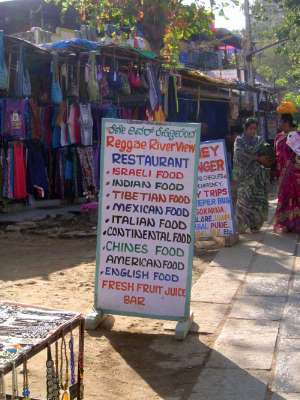 The Soolai or Dancing Girls Bazaar stretches toward the river. Because the temple was no longer functional, the land here was cultivated as late as 1917. Whether it's better this way is debatable. 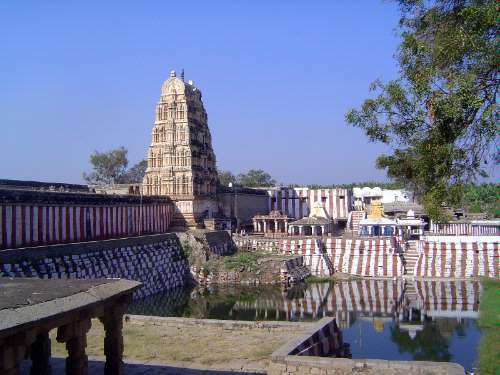 Continuing downstream, we bump into the Narasimha Temple, also called the Jain Temple. 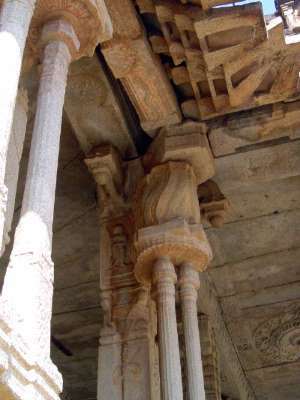 The post may be a manastambha or column of honor, commonly erected before Jain temples. 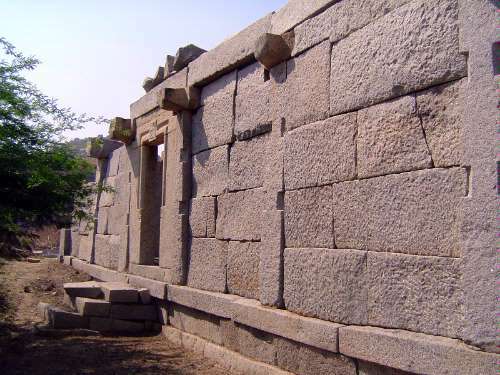 The builders were master stonecutters. You can see the drill marks on one of the blocks. 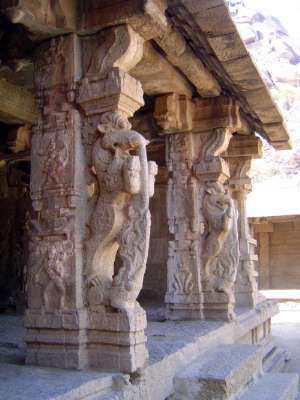 The Jain label comes from the stepped roof, although something very similar can be seen on some of the later non-Jain buildings nearby. 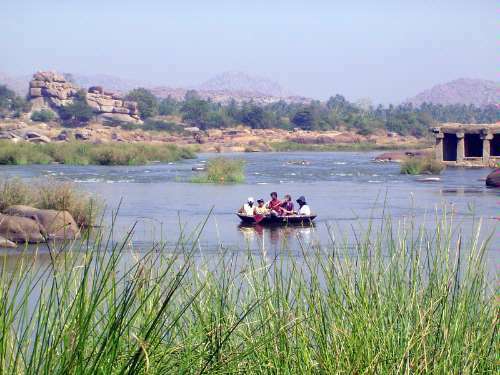 The view upstream toward Virupaksha. 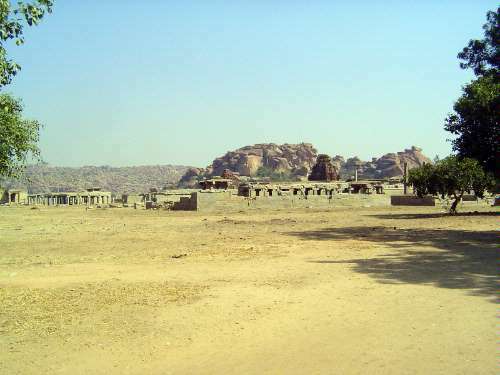 Writing in the journal of the Asiatic Society of Bengal for 1854, a Captain Newbold, stationed at Kurnool, compared the landscape to Sinai and called it the Arabia Petraea of southern India. 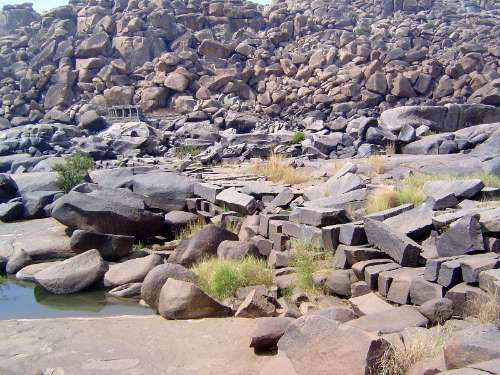 "The whole of the extensive site occupied by the ruins of Bijanugger on the south bank of the Tumbuddra, and of its suburb Annegundi on the northern bank, is occupied by great bare piles and bosses of granite and granitoidal gneiss, separated by rocky defiles and narrow rugged valleys encumbered by precipitated masses of rock...." Nothing much has changed except the decline of polysyllables. 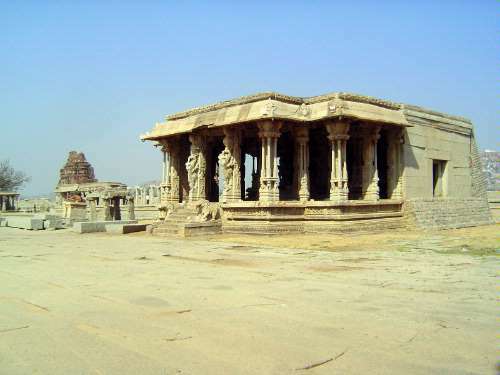 Still further east: the Vitthala Temple, its name from a form of Krishna, himself a form of Vishnu. The gopuram. It's half-complete paint job hints that the tower was on the edge of collapse before restoration. Five centuries ago, it was likely a riot of colors. 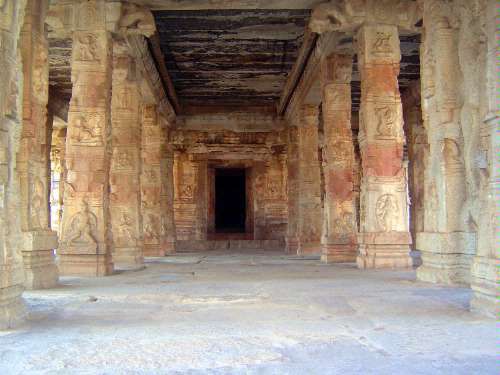 This temple, for the last century judged Hampi's most spectacular, was built late in the empire's history. 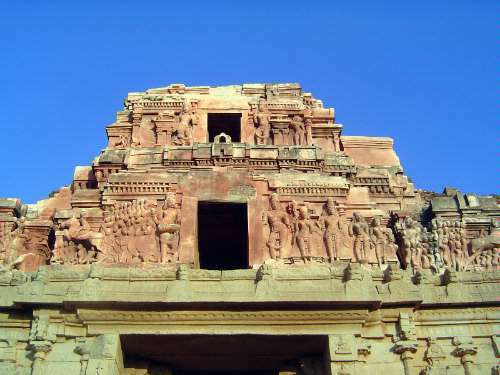 The view here is straight in from the gopuram toward the Kalyana Mandapa. Notice the carved block straight in front of the camera? 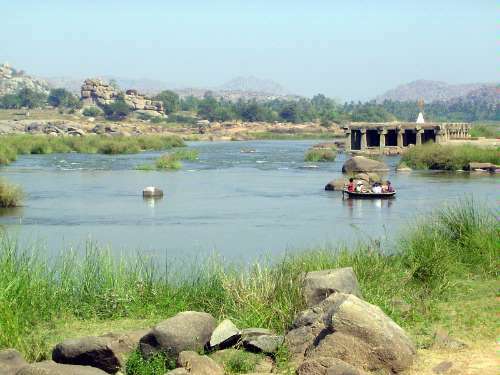 This is the postcard icon of Vijayanagar. It's a stationary stone cart, although according to Fergusson in the late 19th century, its wheels could be turned. (They were turned so much that the axles wore thin. The wheels are now fixed.) Even in Fergusson's time, the cart had lost its top half, made of the usual brick and plaster. Fergusson says that the cap (which can be seen in a photograph from 1856 by Greenlaw) had deteriorated and been replaced by order of a British officer. Twenty years later, he says, the replacement was removed because a fire had cracked the base, and it was feared that the weight of the cap would cause the whole thing to disintegrate. The cart has sat capless ever since, in (as one expert today has written) "a miserable, incomplete state." Still, most visitors don't notice that anything's missing. 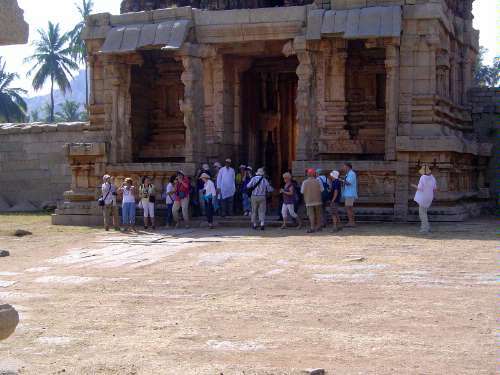 That's the power of famous monuments: they annihilate judgment and reduce visitors to worshipful gawkers. 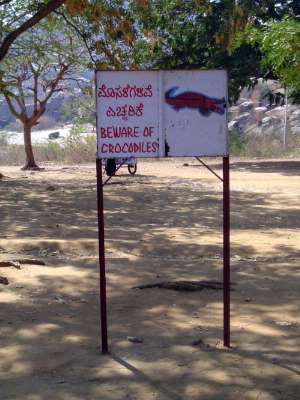 (The critic is George Michell in Verghese and Dallapiccola, South India Under Vijayanagara, 2011, p. 83). 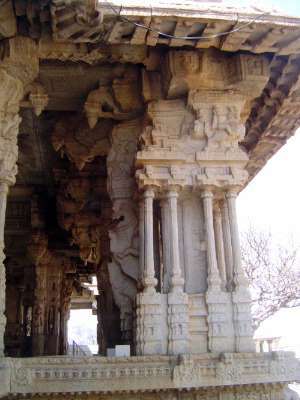 Another side pavilion, with the north gopuram. Tapped with a stick (or even a fingernail) the columns give off a musical note. A closer look. The stone brackets that support the dripstone are purely ornamental and a reminder of the wood form that inspired the eaves. Cut-out colonettes support a flame-like capital. The roof has evidently shifted. 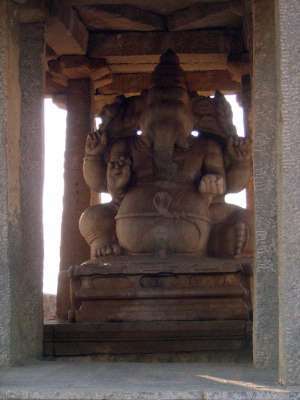 A good view of a mounted yali astride a kneeling elephant. In fact two yalis are stacked, one above the other. Another view. 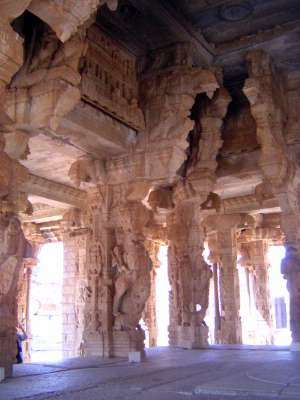 Each pillar is from a single block of granite. 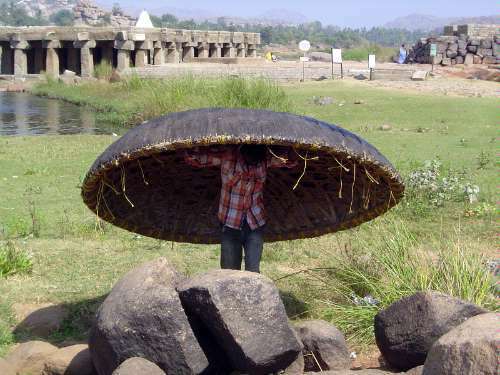 We're going to walk back toward Virapaksha. 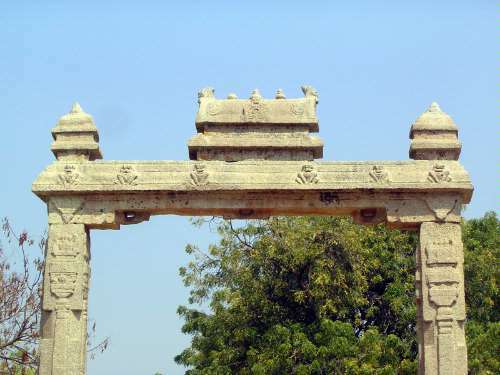 First up, the so-called King's Balance, properly the Tulapurusha-dana Monument. Scales were suspended from the rings at the top so kings on occasions such as an eclipse or New Year's Day could be weighed against matching quantities of gold and precious stones, which were then distributed to temple brahmins. Farfetched? 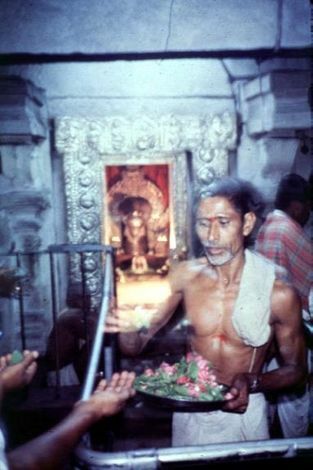 One inscription records Achyuta Raya weighing himself against pearls. Slabs of rock were removed, apparently by drilling and heating. Slow work, though Longhurst in 1917 looks on the bright side and refers to "the unlimited supply of splendid building material close at hand" (p. 3). Where did the road go? Try a bridge. 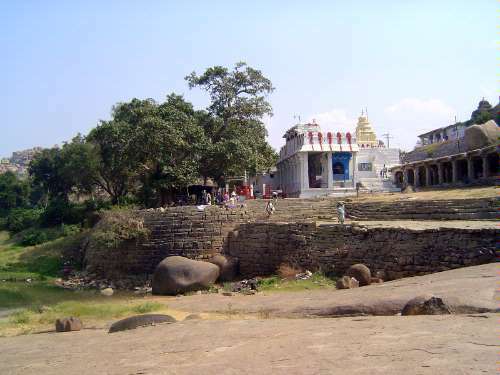 In the background is the Chakratirtha, a place of pilgrimage. The other side of the bridge, which raises the question: then where? Landscapes like this suggest why this location seemed like a good spot to establish a capital. Can you imagine an army launching an assault? 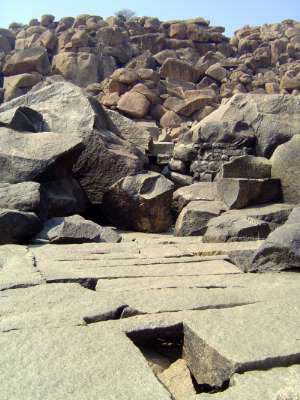 A view of the Chakratirtha. 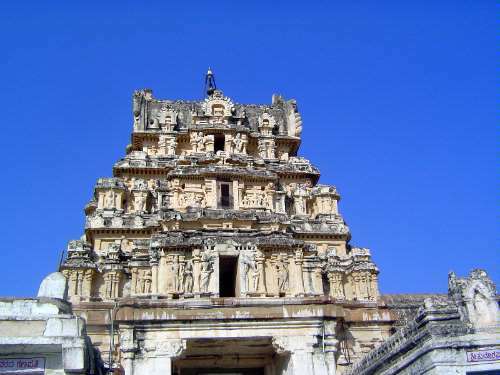 Close-up, with the Kodandarama Temple. The rocks here are heavily inscribed. 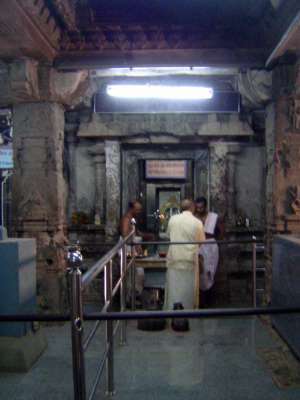 Worshippers pray before the lingam and yoni. 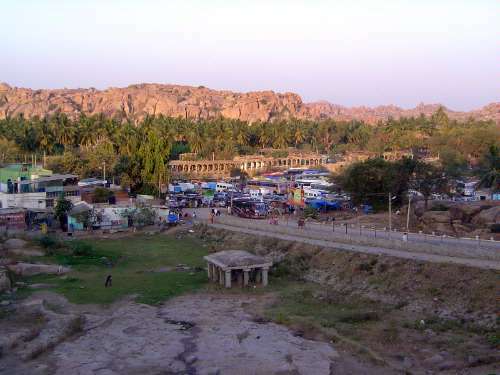 Hampi bazaar and parking lot as the sun goes down. The crowd hasn't dissipated much. 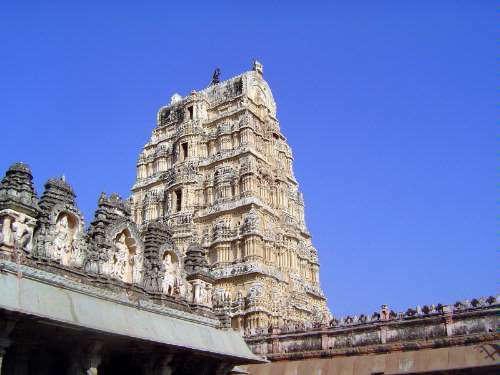 A fuller view of the temple including the second gopuram and the north one. 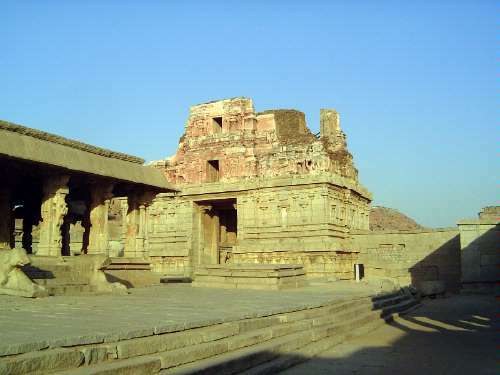 The building at the left once had a stepped roof, suggesting (inconclusively) that it was a Jain temple. 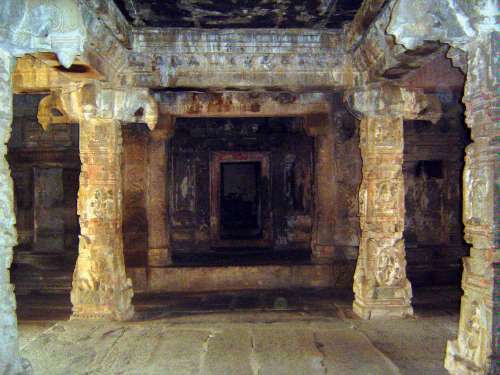 Certainly, Jains were here long before the Vijayanagar Kingdom. 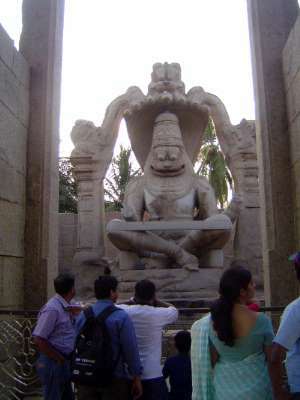 Nearby is a very popular monolithic Narasimha, under a canopy of Shesha, the naga king. Scary? He's not supposed to be friendly. 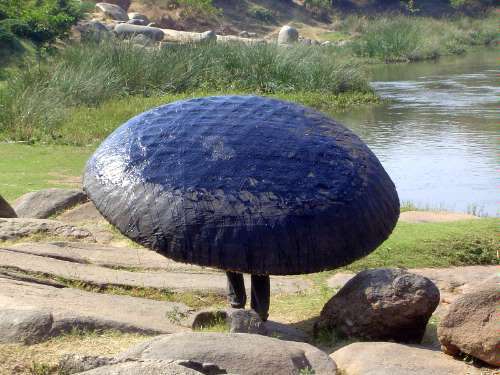 An inscription states that a Brahmin carved the statue from a single boulder in 1528. Before we go on, ask yourself: what do you think of the design? 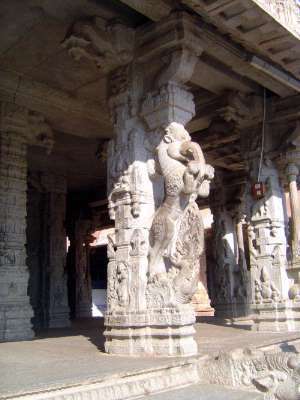 Originally, there was an attached figure of Narasimha's wife, Lakshmi. You can see her arm poking out from more or less under his armpit on the right, but otherwise she's missing. Where is she? She's in pieces at the museum. The curator said she was not on public view but was instead in a storeroom. He said he'd show me. Sure enough: one room had her legs and torso; another room had her head and other arm. The curator said the staff could put it together where it belonged, with the monolithic statue, but there was a controversy. 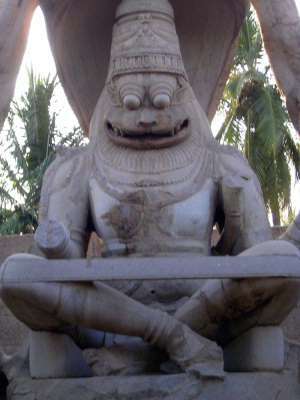 Some sects insisted that this form of Narasimha is always shown without his wife. In other words, they disregarded the existing arm near his torso. 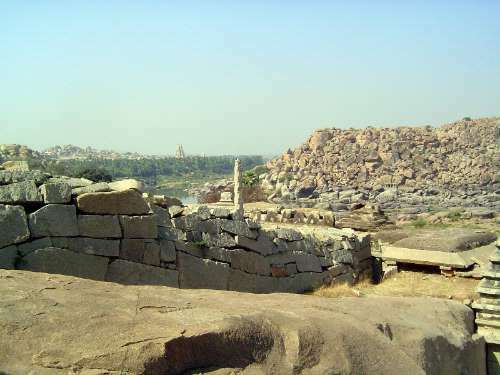 The Archaeological Survey of India was caught in this sectarian controversy and had decided to stay out of the line of fire. "We have so many religious controversies," the curator said. This one wouldn't end anytime soon. "No pictures," he added. Another monolith, this one called the Sasivekalu ("Mustardseed") Genesa. The name is a joke about his size. Nearby, and with a declining sun, there is yet another former bazaar, this one stretching before the Krishna Temple. Until recently, it was cultivated. 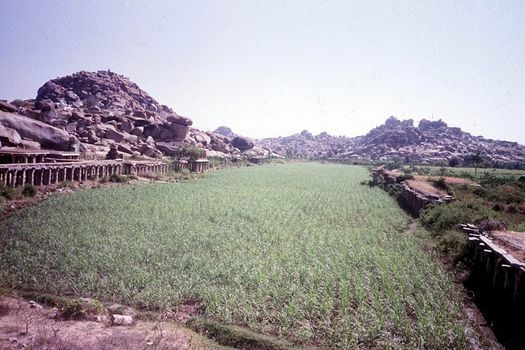 Proof: a sugarcane field in the very same bazaar in front of the Krishna Temple. The photo is from 1981. 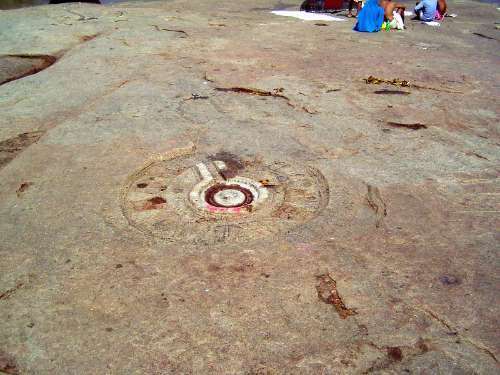 The Krishna Temple dates from 1514, when the king brought home an image of Kalakrishna he had captured from the Udayagiri Fort, atop a seemingly impregnable peak in the Nellore District, about 200 miles to the southeast. 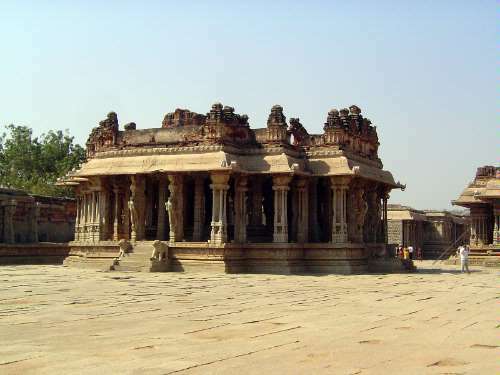 To house it he built this temple, the first sign at Vijayanagara of a Vaishnava deity. 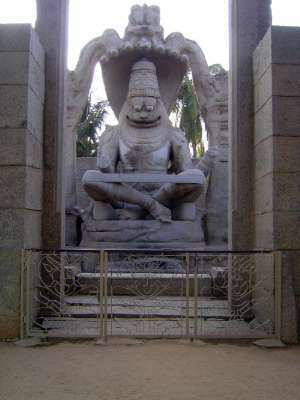 This king, Krishna Deva Raya, was also responsible for the eastern gopuram of Virupaksha, the beginning of the Vitthala Temple, and the Narasimha monolith. 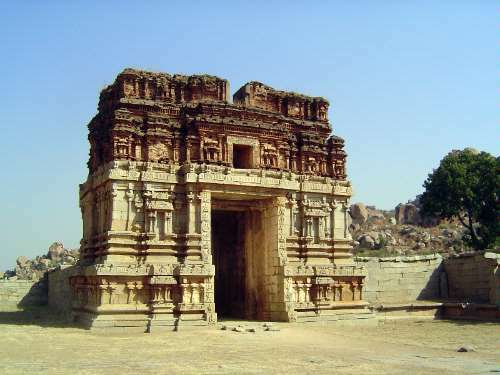 The Hazara Rama temple, which appears in the next folder, was his work, too. 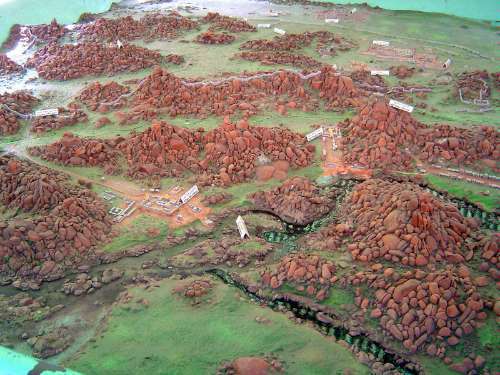 The upper levels, in brick over a stone base, show battle scenes on the left. 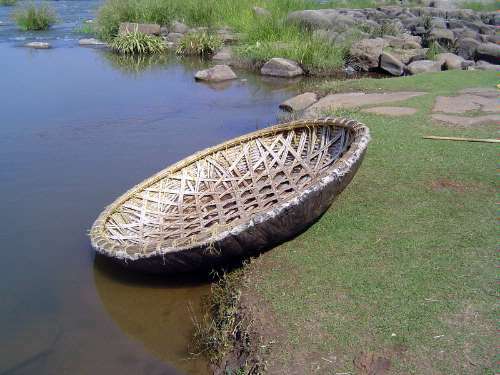 The sharpness of the imagery is a tipoff to the fact that the sculptures are new. Depending on your perspective, this is long overdue or a pity. The dark shrine no longer has the purloined image.